I always thought it was all me. The problem, why all my acquaintances end in a few weeks. But the more I changed, the worse it got. I finally stopped looking and love finally found me. Only then did I find out, that a relationship is common task, needs to grow by efforts from both people together and never can be problem in just one! Fog of Love brings also blurred vision for players, who get white box with headline Fog of Love. This is a hot novel published at the end of 2017, designed by Jacob Jaskov and released under the auspices of Hush Hush Projects. 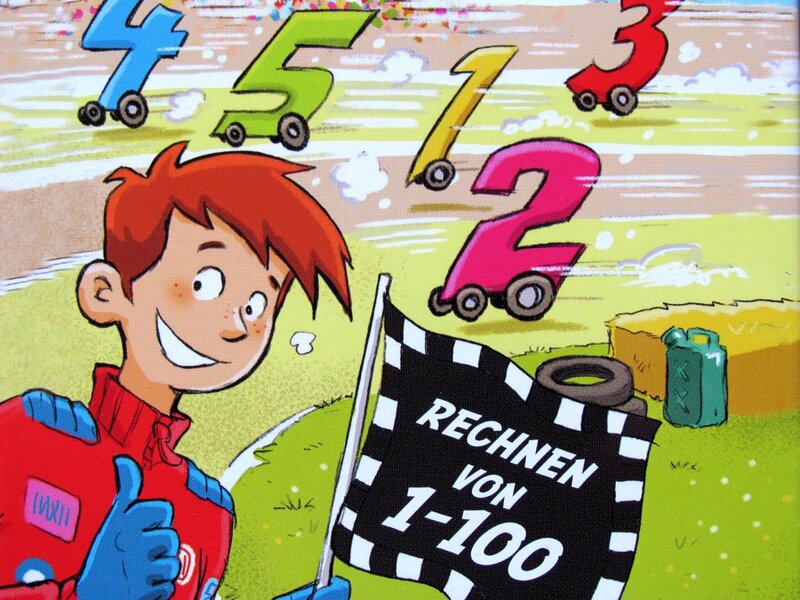 Several illustrations were created by Mike Hojgaard and Lotte M. Klixbull Jaskov. 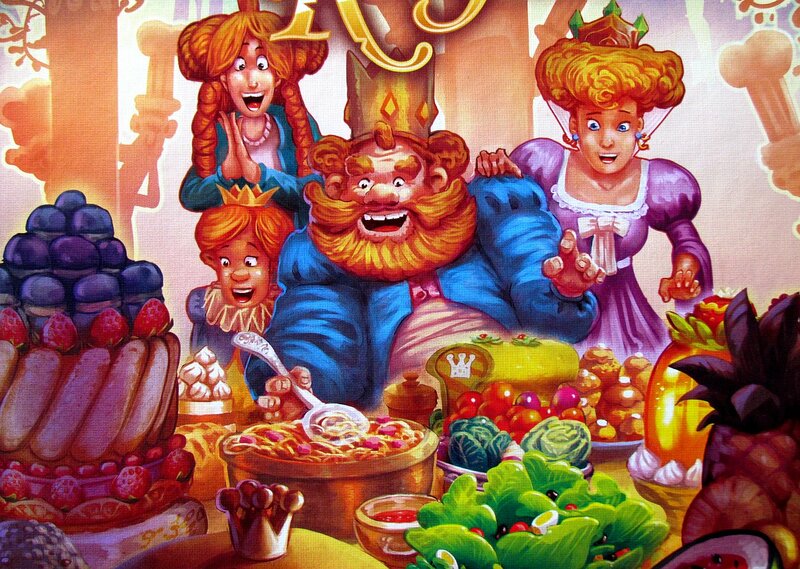 However, game is offered to all European players by Esdevium Games. 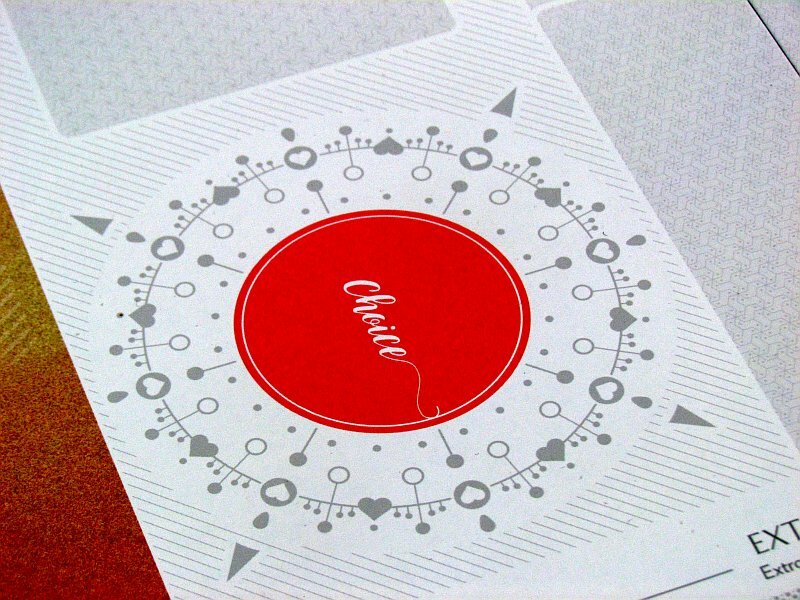 Big box is particularly impressive with its white color, because only one pair of silhouettes can be found on the lid. 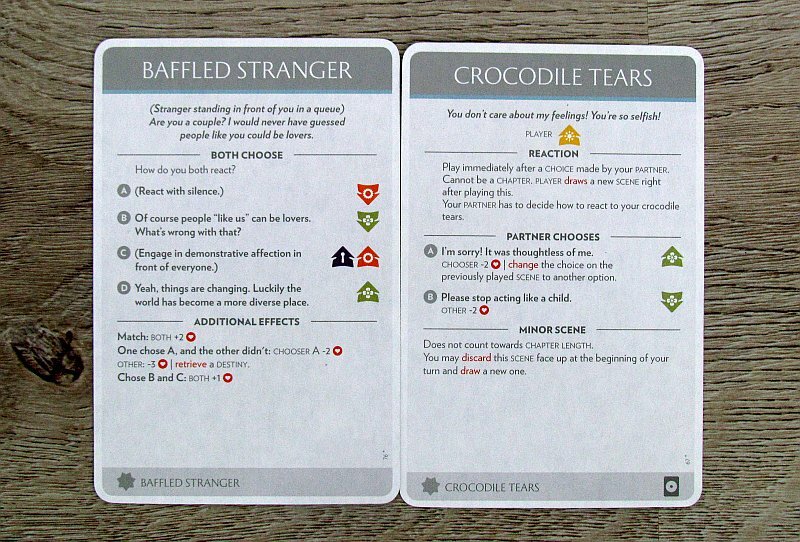 These are two roles ready for players as they begin to explore the contents of the box. There is one big drawer making up the box and big game board lies inside. It is also white and contains mainly positions for cards. Players put shuffled decks of features, personal goals and jobs there. More space is dedicated to bigger story cards, which are divided into three types – sweet, serious and drama. 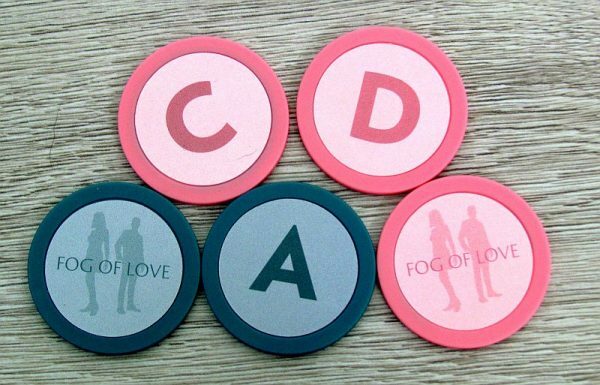 Players must both choose their color (pink and blue) and receive a set of four large choice tokens and a box of smaller round markers. Everyone then chooses gender of his characters (yes, this may be even a gay relationship), puts them correspondingly on the board and at the same time marks zero on the circular relationship satisfaction scale. Of the five randomly assigned personal goals cards, both players choose three for themselves to be placed in the stand. Their opponent can not see them. This is the only real secret information in the game. 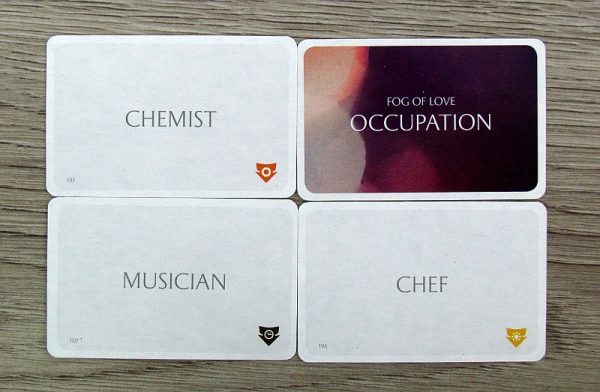 At the same time, however, players also choose a profession and three features for their partner. 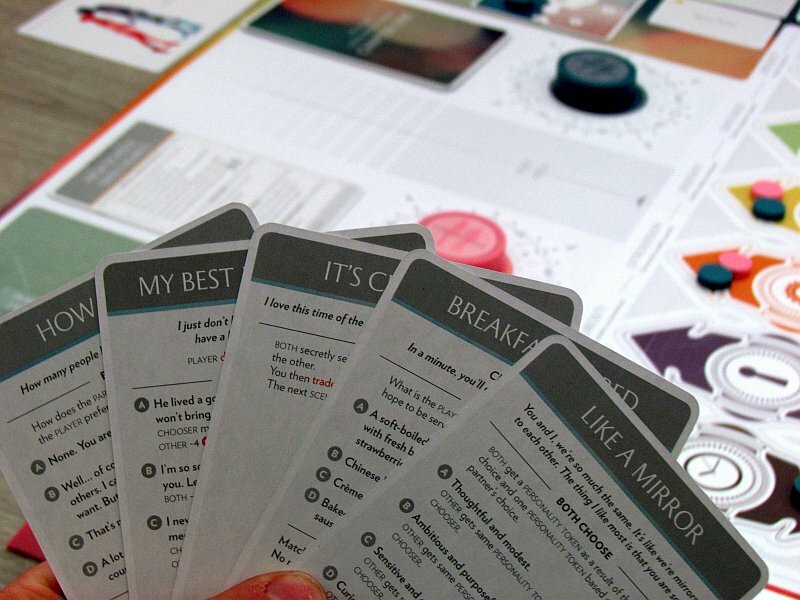 Here’s also the first moment, when players will have to use their narrative skills. They must both name their character and describe him to their teammate. They can let their imagination fly. 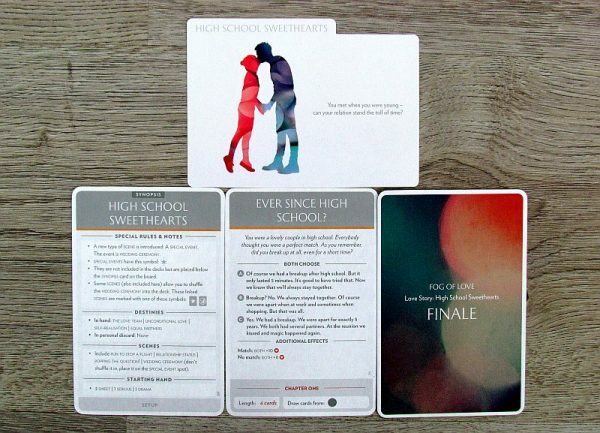 Only after that, players will together select one of the prepared stories and will note special rules according to them, but above all, they will get a set of story cards into hand – combination from all three decks. 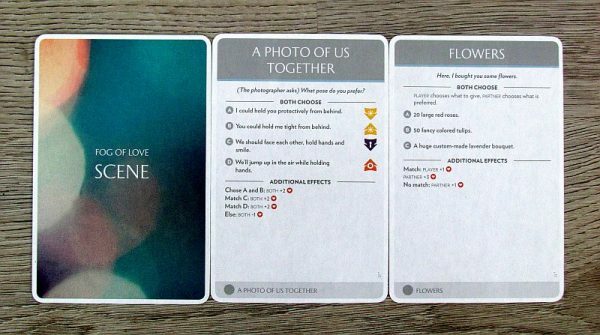 But it also begins with the game itself, in which both participants will collaborate and create the story of their relationship. The chosen story will determine first task. It puts both partners in front of a question, they can answer secretly with help of their tokens – usually with options A through D. Match or difference in these choices determines starting value of satisfaction in the relationship. They mark it with token on their character card. Whole match works in the same way. 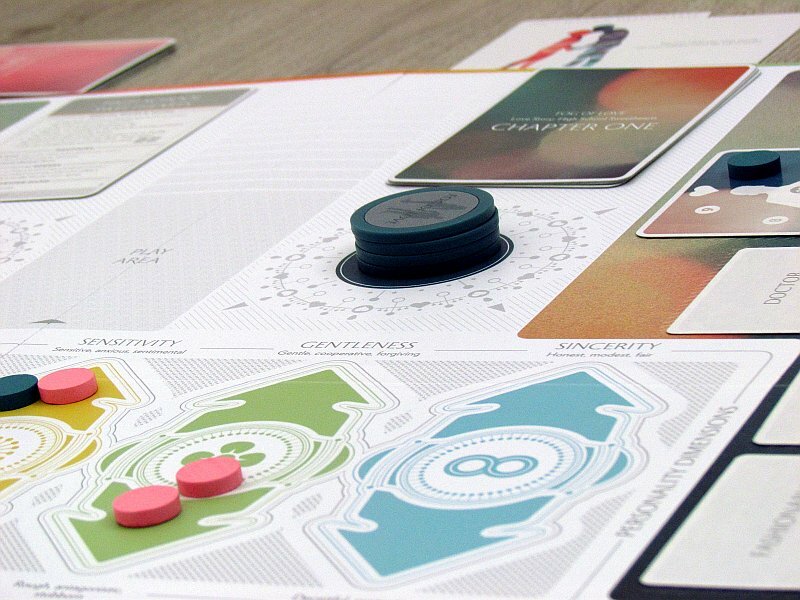 Players always choose one of cards in their hand, creating a situation to resolve. 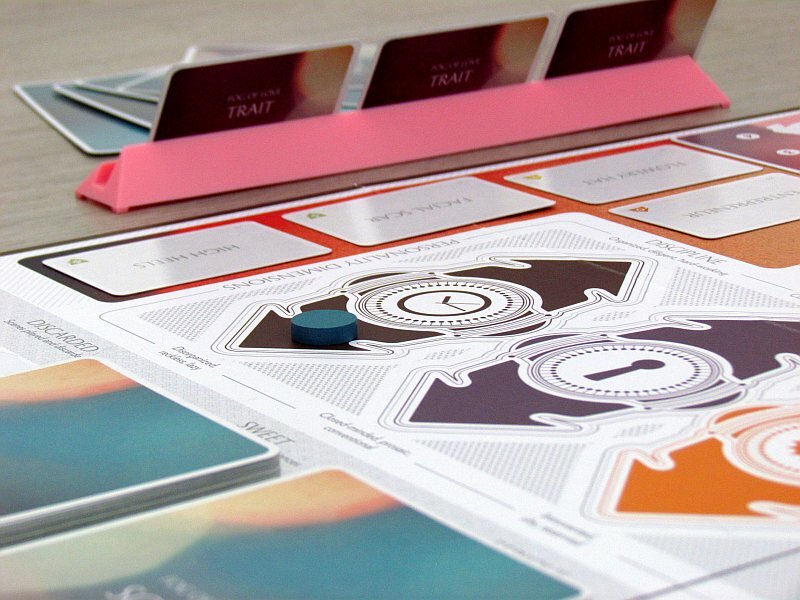 Then one or both players must respond by choosing tokens. None of the options is ultimately right or wrong, but it is always about the current situation and roleplaying it right. 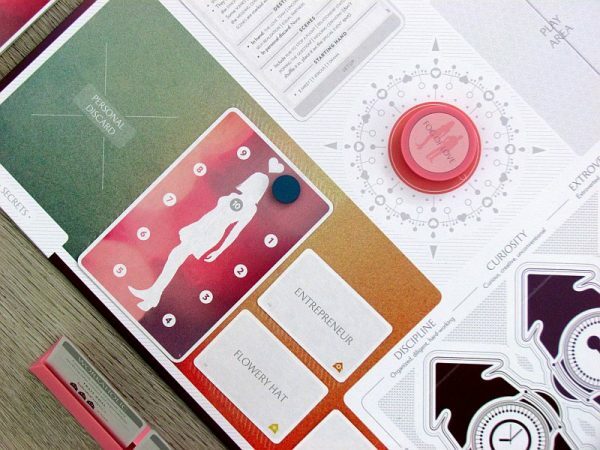 Players, of course, modify success of their relationship with each choice, influencing their satisfaction. At the same time, they also influence course of their personal goals, that are personality oriented. 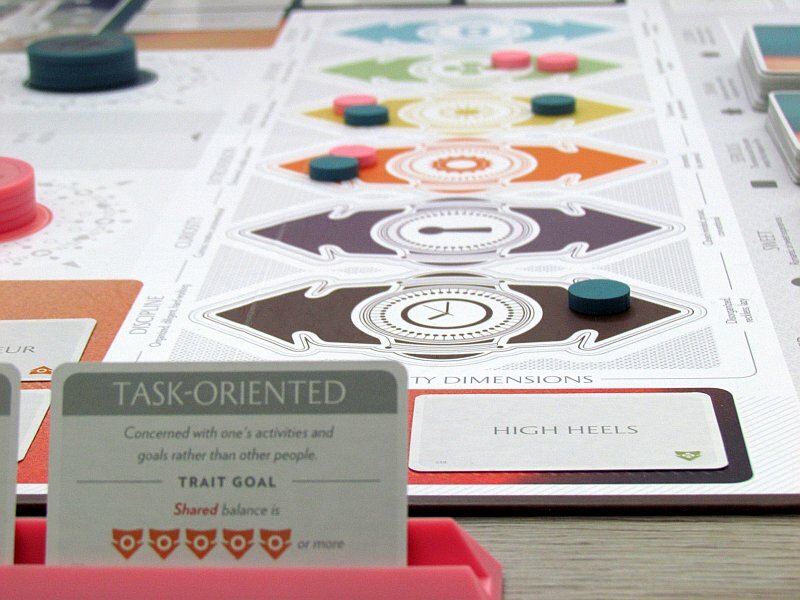 These goals belong to big area of the game board, that deals with polarization of character traits. 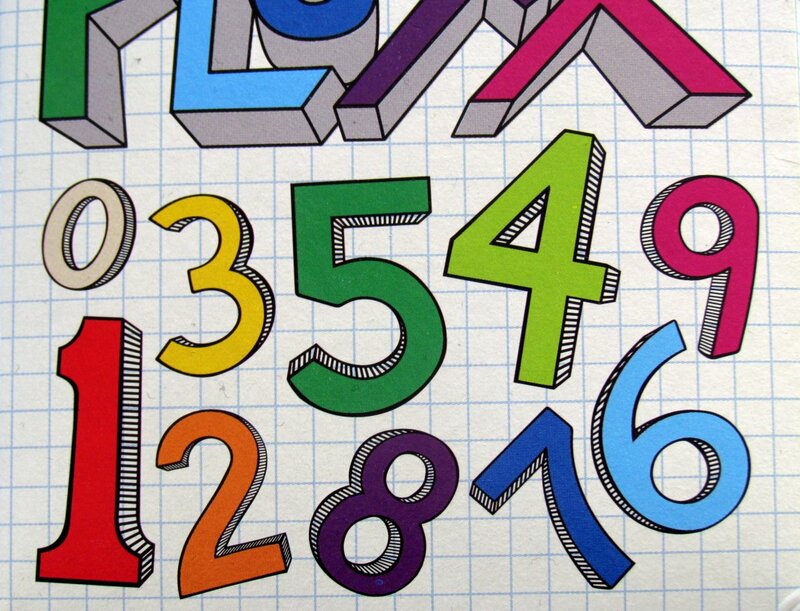 The individual answers are marked and belong to one side or the other. 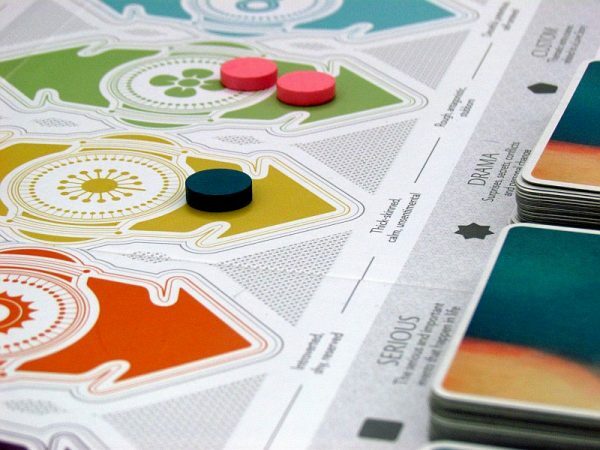 When a player selects this answer, he also confesses to such type of thinking and accordingly places token up or down on the corresponding trait. 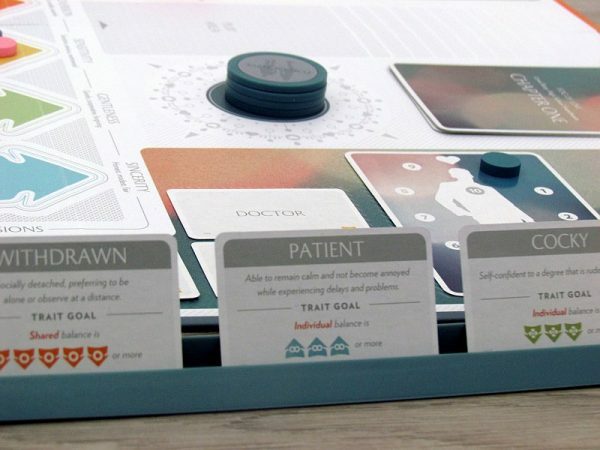 Personal goals then prescribe, that player has upper hand in some direction, either only in tokens of his color or combined amount with partner. Players then ask questions, choose answers, and their relationship and personalities evolve. They are gradually going through three chapters (each with a certain number of cards played), which prescribe drawing from certain story decks. 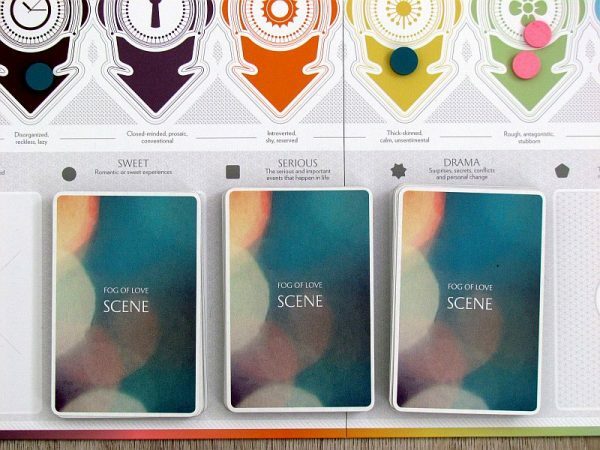 In the beginning, only cards from sweet deck can be drawn (amorous cloud without any issues), but they will gradually have to focus their attention on more serious situations and eventually move to drama. 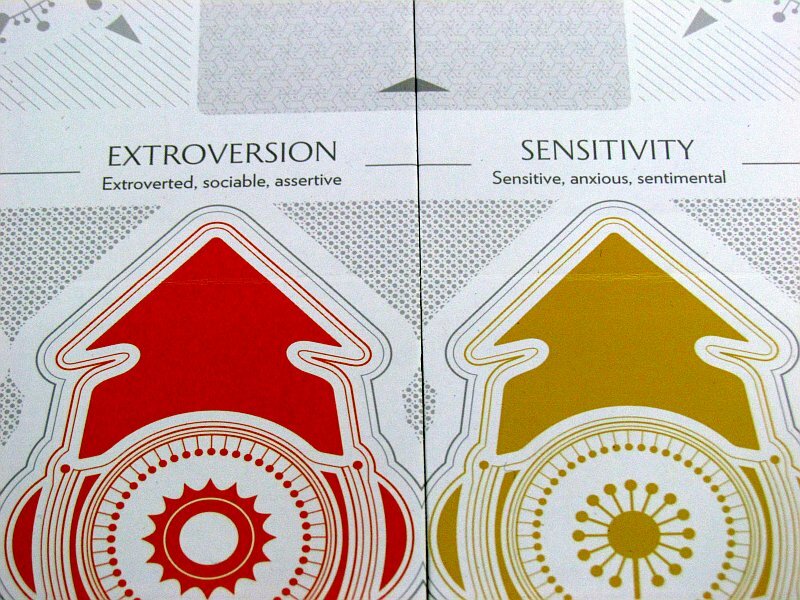 Cards are getting stronger in way they affect the overall relationship. 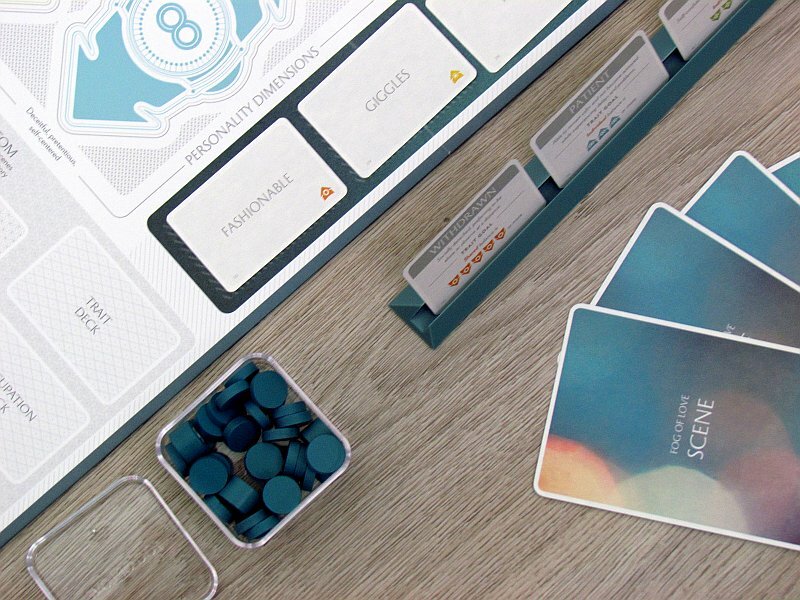 Game also uses secrets, that both players can hide in their stands. But, in the end, all this is about tactics. 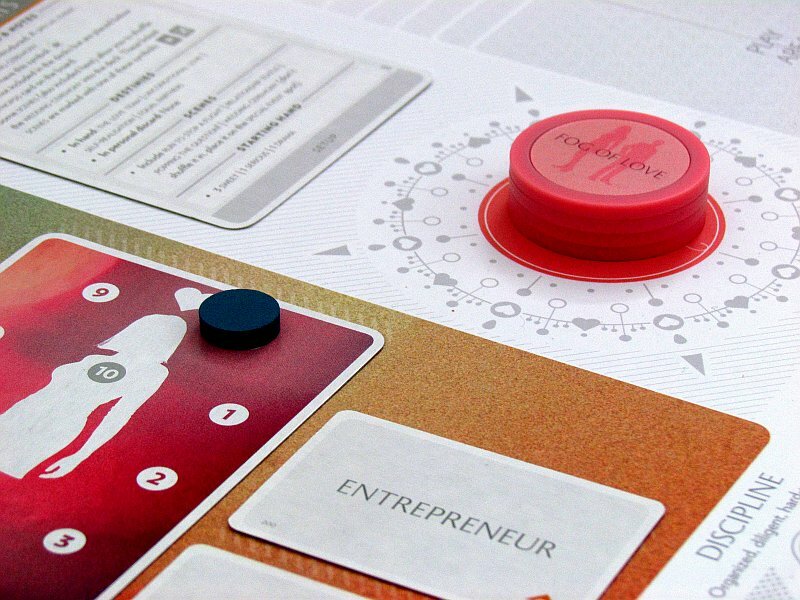 The player have fate of their game from start to end in their hand and have to act accordingly to their cards of goals. And from the very beginning, they can target their plans and answers just according to them. For each accomplished personal goal, players get extra hearts, but lose for those incomplete. Their number and choice of teammate will affect the overall result. 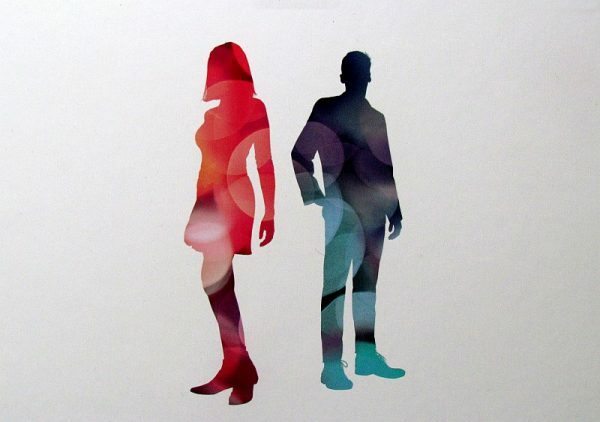 Ultimately, they choose their destiny or decide to break up. 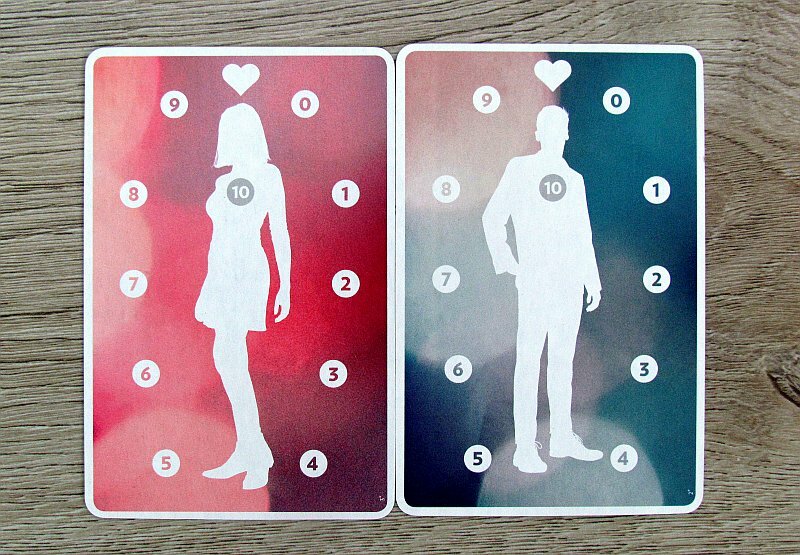 Based on this (and card requirements), relationship can end up happily or completely fail. But Fog of Love is a game you will remember, regardless of whether you succeed or not. Winning is not nearly as important as the story, that players create. And that’s what Fog of Love is all about. Nothing like this can be experienced in other games. The basis for the whole impression is obviously openness of both players. They must be able to live and breathe with their characters. They should make all the choices in their name and not according to how they would behave in their own belief. 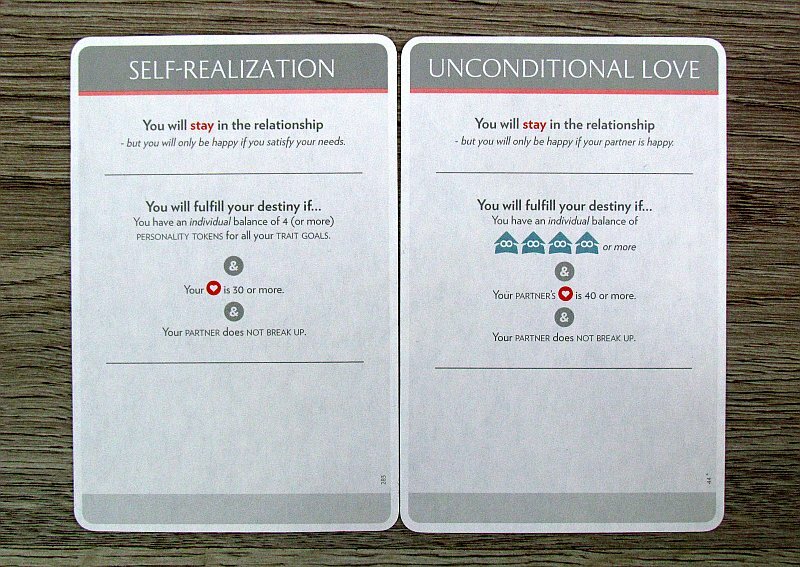 At this moment, they are not themselves, but they are members of a fictitious relationship. Often, interesting and humorous situations arise. 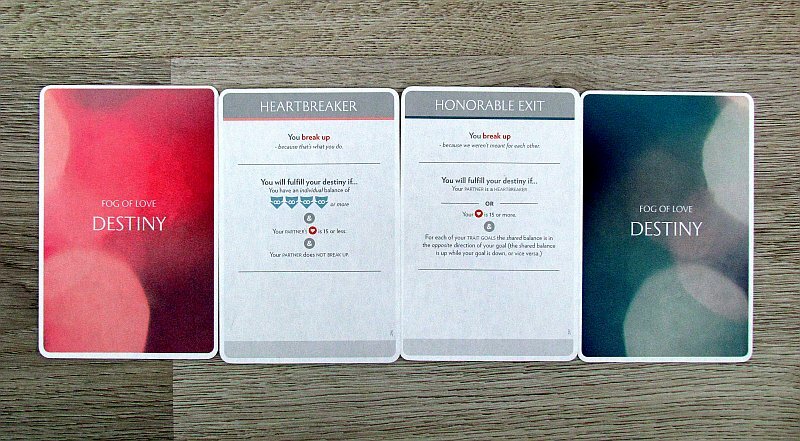 In the first games it seems, that there are enough cards to choose from. Unfortunately, in the later stages, questions will repeat itself mainly in the sweet story deck. That’s because these cards are drawn a lot. All the more important is, that players always have to approach questions and its possibilities differently according to the current situation and their current traits. But ability to deduce is also important. 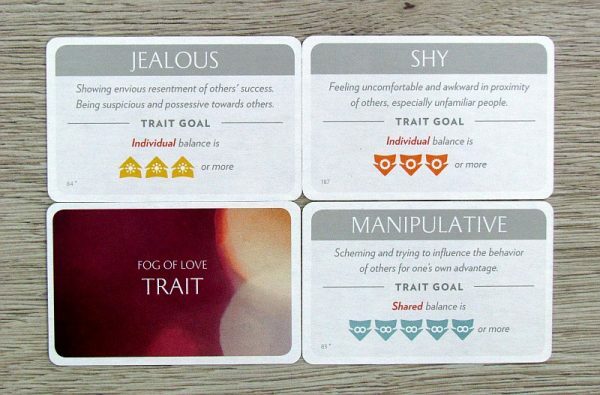 Some personal goals are common, and players have to make a good estimate of their partner – which traits he has and in which direction he wants to shift personal characteristics. Players should not fight on a scale against each other and should attempt to replace such a goal (there are moments, when game allows you to do so). Questions are interesting and often involve interesting possibilities. That’s why players also enjoy it as a whole, especially if both partners properly comment their choices. Because the game is very original, it is not easy to learn. The author was aware of this, and prepared amazing tutorial using shuffled instruction cards into all decks, which are great to learn it. Despite much reading and talking, game is not overly long. Setup takes a while, but then everything goes fast and whole romance will end within one hour. During the course, both participants will experience a lot of things, that are combined into a single story. And all goes well, both players are constantly interested in their story and hour will run away and you won’t know it. 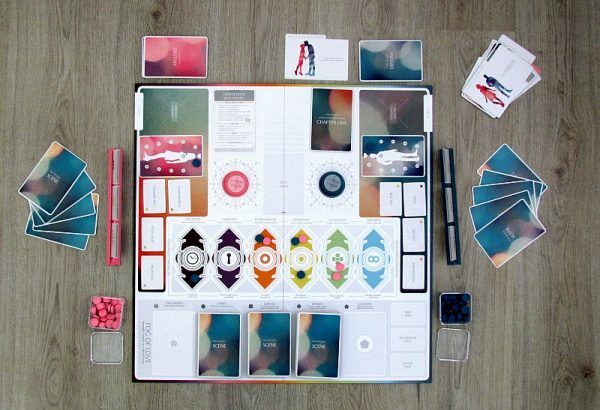 Game is fantastic for couples and this is a true romantic comedy in a box. So if you do enjoy watching movies, that are always the same with woman falling in love with a man, then you can write your own stories in here. 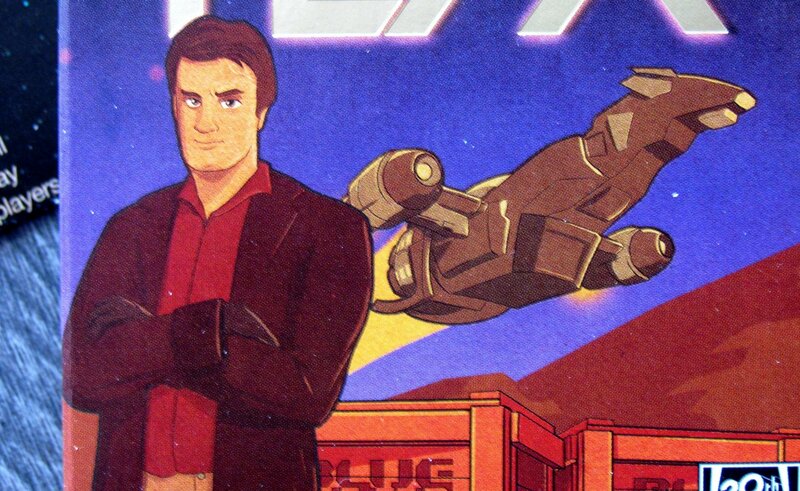 It’s actually cooperative fun, but not as a whole. There are hidden agendas. Players have their own destiny cards and can win only, if they fulfill their chosen fate. Processing of the box and its contents is excellent. 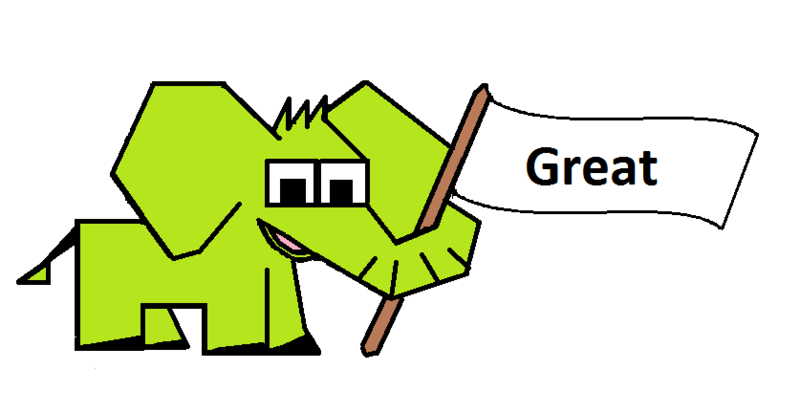 Graphics and icons are chosen very sensitively. Great impression begins already with the box, storage of components and their quality. 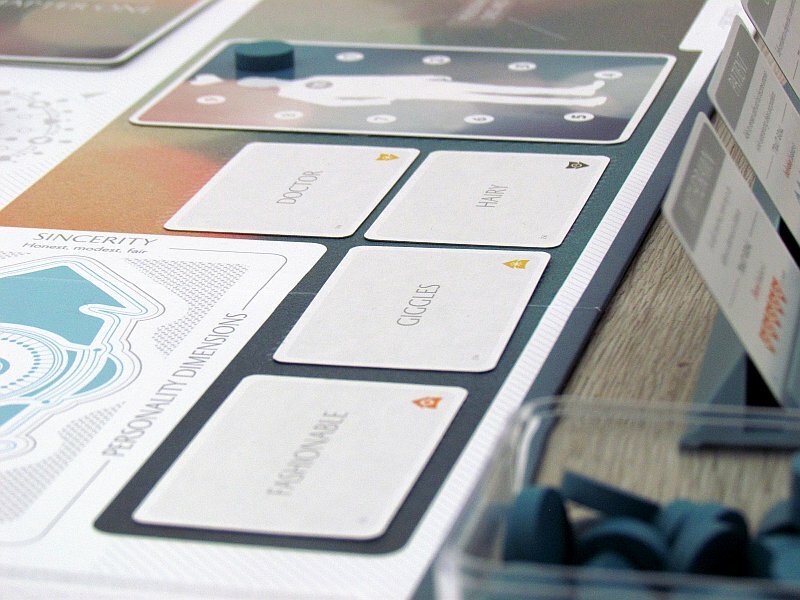 Tokens are stored in transparent boxes, from where the players take them during game. Cards have stands. 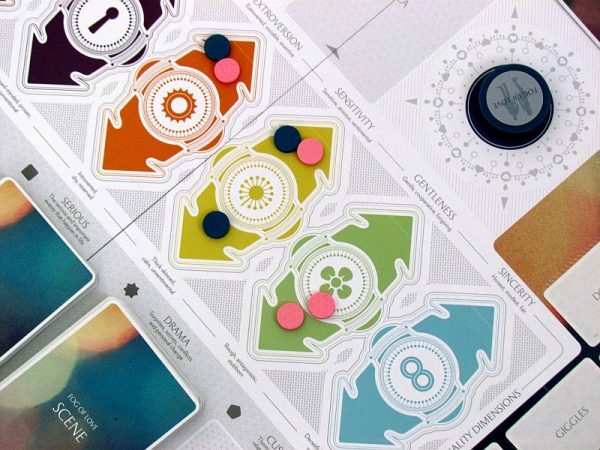 In addition, there are three other stories in the box, that add new rules and effects, making the game even more complicated and difficult. Later, however, players can also create their own combination of cards. 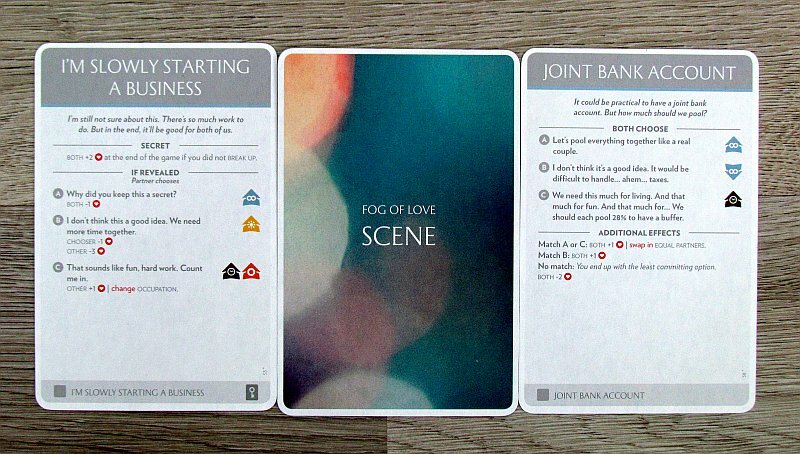 Fog of Love is an incredibly original game, that combines narration, playing cards and hidden goals. 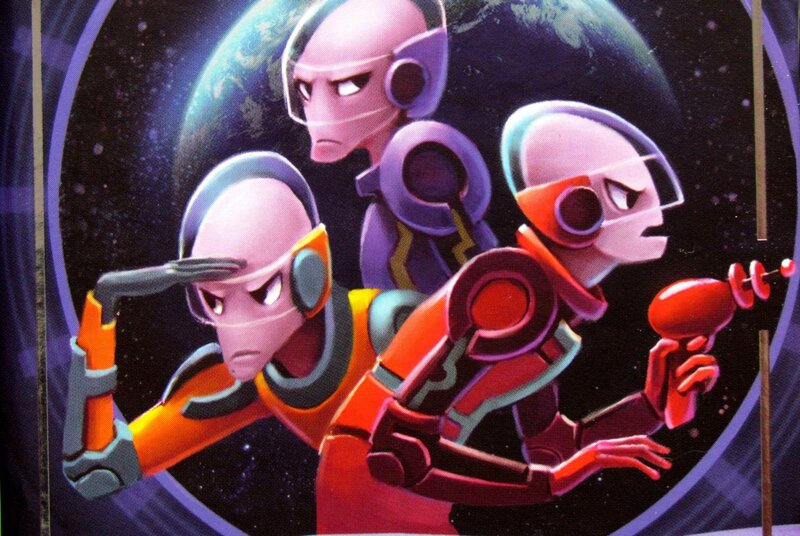 In addition, it is based on cooperative entertainment, that emphasizes experience. And so obviously there is space for only two players. But they enjoy a new storyline every time they start playing. They can live in their character skin and make decisions for them. 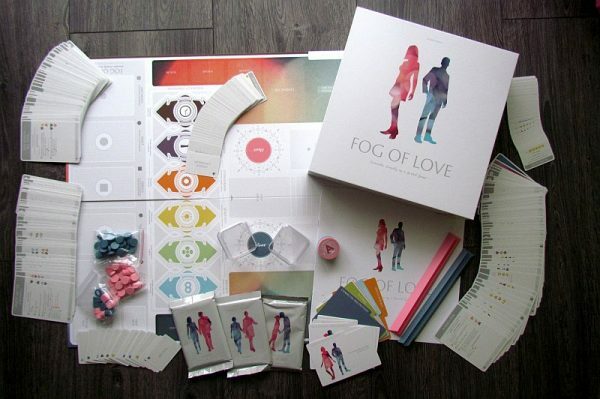 Fog of Love is a true romantic comedy, that works also amazingly as a board game. Rozšíření Fog of Love: Country Fair, Fog of Love: It Will Never Last, Fog of Love: New Occupation Promo Cards, Fog of Love: Paranormal Romance, Fog of Love: Promo Card Set, Fog of Love: Trouble with the In-Laws, Fog of Love: What should we go to? Fog of Love is a board game, in which its about taking on another person's skin. This is an absolutely unique thing, that let’s you live a romantic comedy from first date. And you should try it at least. It's great game for couples, who know each other well. They can try dating as completely different characters and try to face random events and unexpected situations. 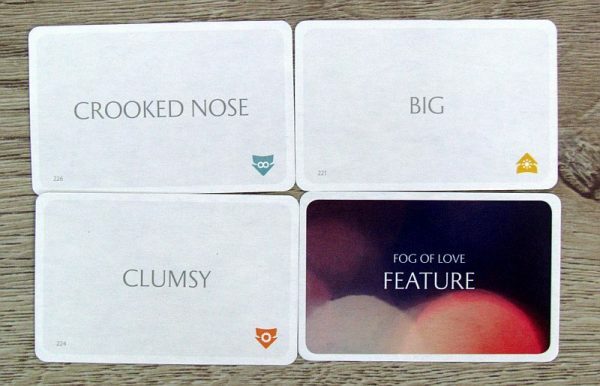 The originality and the ability to entertain two players are the qualities, that make Fog of Love a real hit.